I am pretty committed to watching any and all horror movies in October. 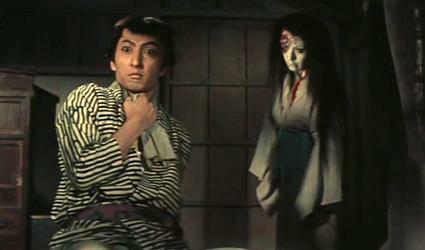 So when this small Japanese ghost story came across TCM, I figured I would watch it. Sure, I knew nothing about it, and figured it might be silly. But that’s how you find new things. Turns out, it is just a little bit crazy. I watched THE GHOSE OF YOTSUA (Tokaido Yotsua kaidan) (1959) on 10.14.14. It was my first viewing of the film. This is a film which starts out like so many other Japanese samurai films. A samurai asks a man for his daughter in marriage. The man refuses. A fight ensues. Murder happens. The samurai, a ronin named Iemon (Shigeru Amachi), marries the daughter anyway. This is where it diverts in tone and content. It becomes a film about a contemptuous husband poorly treating his wife. THE GHOST OF YOTSUA is a story based on an old Japanese legend. It tells of a man who becomes angry with his wife and their collective poverty. He murders her to marry a rich woman. It takes this film a long time to get there. We go nearly 50 minutes in an 80 minute film before Iemon gets the gumption to do what we know he will. Much of the film is spent with him doing selfish things and then feeling bad about them. Once the murder is set into place, this movie goes in yet a different direction. Said another way, you don’t often associate 50s cinema with graphic images of amputated arms, faces melted by poison, sliced foreheads, or bloody ghosts suspended from the ceiling. But those are all things that this movie delivers. Much is made of the 90s and early 2000s Japanese horror movement. Those films are the sons and daughters of this film. This is a film, directed by Nobuo Nakagawa, which also delivers some nice, patient samurai sword fights. It provides lots of excellent camera work which switches between being intimate and making us feel like we are in various rows of a theater. The colors are not overly saturated, as often happens in late 50s color cinema. We get nice uses of foreground and background focus. This is a well made film with spectacular and dynamic crane shots, as much of the early part of this film takes place in long takes of long shots keeping us at bay. One particularly nice shots include a scene taking place in front of red hued water as Iemon makes the decision to murder his wife. And that is all before this movie gets into its horror mode, in the last half hour, and goes all kinds of crazy with unique shots and angels and non-Western symbolic imagery. The first 45 minutes of this movie are relatively slow going, but nice to look at. Especially considering that the content is a well known folk tale, the wait seems unnecessarily long for the action to get running. However, once it gets there this is a film which delivers the freaky images in a surprisingly modern way. The scares are legit, and bold. The imagery may become slightly redundant, but the way it is shown feels fresh. The final shot is truly haunting. For the first half of this film I would have said that this is not one worth seeking out. But, having seen the whole thing, it is one which will reward the patient viewer. This feels like ground breaking horror, even as its content in no way resembles the modern horror formula. ~ by johnlink00 on October 14, 2014.